Neftohimic 2010 Burgas squandered a 2-0 lead to drop the first leg match against Vojvodina. United Volleys rolled to a 3-0 win over Posojilnica in the 2nd Round of the Champions League. Averill lead his team with 20 points, but dropped a tight match 3-2 in the first leg of the 2nd Round. 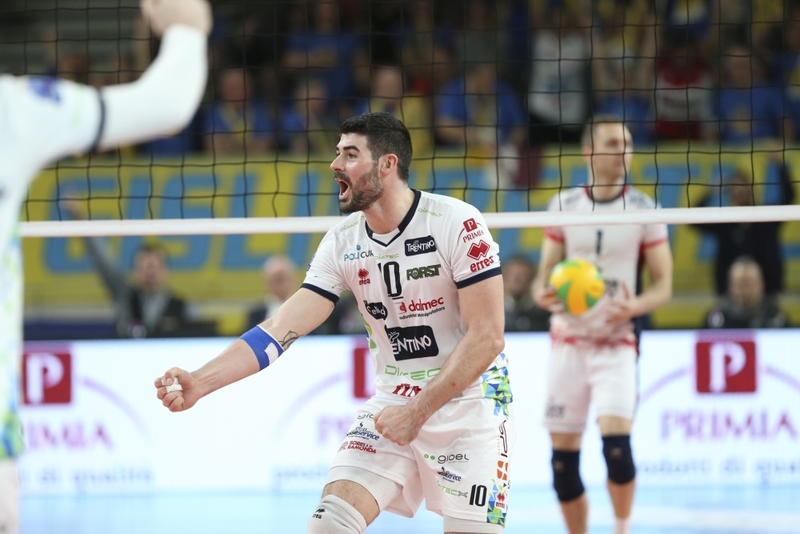 Trentino’s Champions League loss to Zaksa drew the ire of some Italian fans, who chose to take out their anger by shouting slurs towards the team’s captain Filippo Lanza. Such hostility is surprising, as aside from being Trentino‘s captain, Lanza has been with the team for 12 years. He was also the squad’s leading scorer in the match, which put him only one point behind Osmany Juantorena for the team’s all time 2nd highest scorer spot. “We hoped that this was only a rumor, but we recently got confirmation from trustful sources. We are baffled by what transpired last night in our arena, when fans insulted our captain Filippo Lanza. We do not understand if these people have some mental problems (it could be), but we believe that attacking a player on a personal level because you lost a game is not acceptable. Only beasts criticize every mistake and insults a team when things go wrong. Curva Gislimberti is not associated to these attitudes and condemns all these people for the s*** behavior expressed towards our player, who first of all, is a human being who has given so much to Trentino in the last 12 years, first as a youth player, and now our captain. We are talking about a team that in the last 15 league games won 13 of them and which qualified for the Champions League playoffs with 1 game in advance. Every now and then we think that people have got used to success, and do not remember how it was to play for salvation from relegation on the last day, to rejoice for a single set won at Palaverde, or to think about the excitement of having a team in A1. All this is now taken for granted. But if one day this is not be anymore, people will regret it, because they are missing their chance to see great volleyball. To those who want to continue insulting players or staff we invite them to do one thing: STAY AT HOME. “I begin my message by apologizing. Sorry, because on Thursday evening I gave importance to what some people had to say, without valuing true friends. What I gave to Trento remains less than what I received from Trento. Excuse me, because it is not of me to go away without saying goodbye to those who have always supported me in good and bad luck. I have always shown everything to you all and I am proud of it because you are and you will be my family. I thank you for suffering with us and for defending us in times of need, I thank you for accepting us and supporting us with perseverance and suffering. Trentino currently sits in 4th place of A1’s standings with a 16-7 record. It has already guaranteed a playoffs spot in Champions League play.